I have been so bad about making stuff for the boy. Really. I've told him I'd make him pants and quilts and lunchboxes and all sorts of things. You know what I've made for him thus far? A drawstring pouch (that was really just a vessel for chocolate) and a rather poorly constructed wallet. He used the wallet to death in spite of the construction, so that was good at least! So this Valentine's Day I decided to remedy that. Somewhat. There are still plans for future makes! First up: Portal wall hanging. I was pretty excited about this one. I wasn't actually planning on it. I was originally just going to make pajamas. But! I was struck with an idea and went hunting for patterns.I was going to make the patterns myself if they didn't exist, but I got lucky! Thank you, Fandom in Stitches. 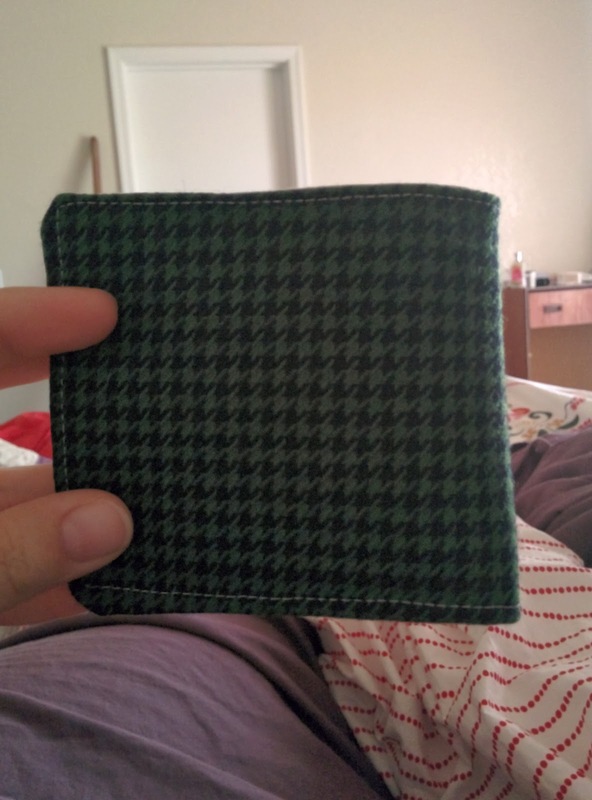 I also made a new wallet. This time I used a pattern from the wonderful Noodlehead. Last time I sort of half followed a random Pinterest pattern and half did what I want... It was okay. But this one is better! It's a good basic bi-fold that uses suiting on the outside. Kinda cool. The gifts were definitely well received :) And we've been designing a quilt for him together, too! I want to get it done before his birthday at the end of May. Of course, I haven't started yet. Or even bought fabric. But I have a sketch and the yardage math done, so I'm on my way! More on that... probably when I actually buy fabric. Feels good to have gotten something done for a change! What have you finished lately? Very cool! I bet he was thrilled! Love the wall hanging, what a great project for a boy!